Scores of people, some with balloons, others with placards, most with cameras, and a later motorcade, combined to give a fitting welcome to the champion West Indies Women’s Twenty20 World Cup team this evening. The ladies led by captain Stafanie Taylor arrived at the Grantley Adams International Airport via Virgin Atlantic and were treated to a resounding reception fit for queens. In addition to family, friends, school children and cricket supporters, Minister of Sports Stephen Lashley, Minister of Tourism Richard Sealy, former West Indies greats Sir Wesley Hall and Charlie Griffith, the Mighty Gabby and the Royal Barbados Police Band, were also present to welcome the party. The West Indies Women’s team and a few members of the men’s squad arrived just after 3 p.m. on Virgin Atlantic. West Indies selector Courtney Browne and West Indies captain Stafanie Taylor. At right rear is Minister of Tourism Richard Sealy. 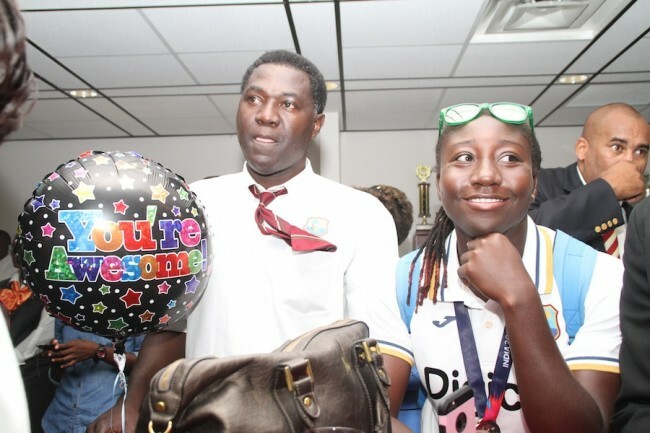 Shamilia Connell (right) and Shaquana Quintyne arrive home. Offspinner Anisa Mohammed smiles at the fanfare. The Mighty Gabby and these pupils of St Paul’s Primary gave the cricketers a musical welcome. Assistant coach Ezra Moseley was a happy man and rightfully so after working closely with head coach Vasbert Drakes and the management staff over the past 12 months to make their historic achievement a reality. This is the first time in World T20 history that West Indies women have won the title after defeating Australia in convincing fashion to lift the trophy in India this past Sunday. Ezra Moseley addresses the gathering. One of the outstanding players coming out of the Twenty20 World Cup was Hayley Matthews who warmed the hearts of many cricket fans around the region with her performance in the final. She was greeted with lots of hugs and kisses especially from her proud parents Mike and Lisa. Speaking with the media the talented athlete said it was an exciting moment that really hadn’t sunk in as yet. She added she was happy that she chose to play cricket, which is her first love, as opposed to track and field that she also enjoys. “My heart has always been on cricket and to be able to know that I followed my dream and came out on top in the World Cup is a really good feeling. I played against Australia nine times and that was a pretty good win and it came at the most important time. Hayley Matthews is greeted by dad Mike Matthews. “Playing for West Indies is something I have dreamt about very young carrying my team through to a World Cup final and bringing it home for them. I had an opportunity to really bring it home but the fact that I got out flustered [and brought up] all kinds of emotions running off the field towards my teammates,” said the former Harrison College student. Lashley told those gathered that West Indies’ win should reflect their dominance in international cricket and therefore should be given the ranking it deserves in T20 cricket. His parliamentary colleague Sealy shared his sentiments and added that the sport of cricket united the Caribbean like no other entity. Only four of the West Indies’ team flew into Barbados this afternoon and these were Samuel Badree, Sulieman Benn, Ashley Nurse and Andre Fletcher. Those with IPL contracts remained in India while others like captain Darren Sammy and Johnson Charles returned directly to their respective homelands. Sammy has had the Beausejour National Stadium in St Lucia renamed the Darren Sammy National Stadium in his honour.